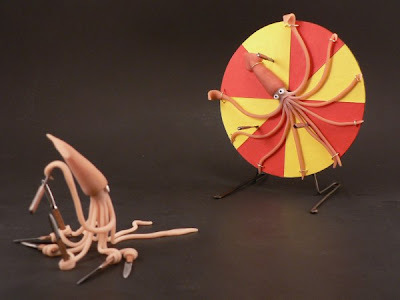 EN Knife throwing squids in the ring! More suspense than a highrope, more fun than a clown! Come and see, more knead art by Justina Kochansky at her pages! DE Messerwerfende Tintenfische in der Manege! Besser als jeder Clown! Kommen und staunen! Mehr Knet-Artistik von Justina Kochansky auf ihren Seiten! FR Des calamars lancant des couteaux dans le manège! Plus captivant que la corde, plus rigolo que les buffons! Venez voir, aussi sur les pages de l'artiste des statuettes Justina Kochansky.